Many of Tasmania’s most vivid landscapes have been bequeathed us by ice. Yet even a deep and prolonged association with both the fact and the landscapes only partially readied me for the drama of seeing a working glacier. The U-shaped valleys of Tasmania’s Lake Judd have a clean elegance, while the steep sides of Lake St Clair wear a forest-fringed softness. Even the vertiginous cirque walls of Lake Huntly and the sharp aretes of Cradle Mountain have a finished look, as though the ice has stepped back to admire its work. All of Tasmania’s glacial landscapes seem to mix even their most abrupt shapes with a sense of mellowed age, a vintaged wine whose astringent elements have been tempered through time in oak or bottle. While flying over the altogether younger ice-fields and glaciers of Baranof Island in south-east Alaska, there was still a white-wedding aura about the uncomplicated virgin white of the stunning scene. Snow white purity dominated, with the somewhat dowdier peaks and lakes merely making up the wedding party. Given this gentle introduction – and my own Tasmanian conditioning – I was ill-prepared for the shot-gun wedding that is the South Sawyer Glacier. 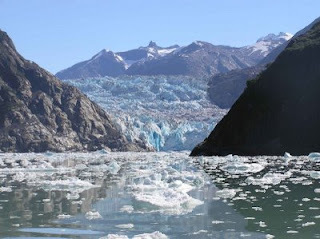 One of Southeast Alaska’s many sea-level or tidewater glaciers, South Sawyer extends more than 30km to the sea from the 2,500 metre mountains and ice fields of Canada and the Tracy Arm – Fords Terror Wilderness. The glacier guards the landward end of the vast Tracy Arm fiord, once a glacial valley itself. The day of our visit is a rare and gloriously blue-skied Alaskan day. 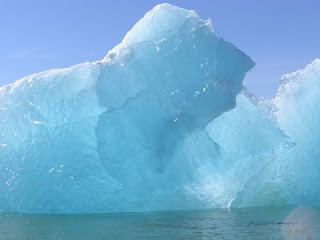 But it is the blue of the glacier that initially steals the scene. This is no blushing white glacier, nor even a pale, powder blue one. John Muir truly called it a “quick and living blue”. South Sawyer presents a huge rough-cut maw to us across the terminus of Tracy Arm, grinning with deep cobalt ice-teeth. If at first all seems silent, we soon discover otherwise, for this is no stately and static set-piece. Both teeth and ‘food’ are in motion the whole time we are there. Crashes and clashes of rock, ice and water are seen and heard all around. Meltwater shifts great quantities of rock and silt from the steeply enclosing walls and from beneath the glacier, pouring them into the water in torrents or loosening them for gravity to take its turn. Boulders tumble with loud, echoing thuds. Yet to the eye – fooled by the clear air and lack of vegetation for scale – the boulders look like mere clods of earth, fraying into fragments as they fall. With slow, chaotic regularity bergs of varying size slice off the glacier’s face, again seeming mere slivers until the sound reaches us with a thunderous roar. To call these juddering collapses ‘calving’ – a term that for me has gentle bucolic associations – seems to down play the rugged reality of a birth under the pressure of both gravity and the bullish weight of ice pushing from behind. Or is my perspective overly urban and masculine? Perhaps giving birth – even bovine birthing – really is as noisy, dramatic and messy as this. As we watch and listen, some of last week’s bergs squeeze quietly past us. It is like rubbing shoulders with the ancients. Each luminous blue beast may be literally prehistoric, made up of compressed snow that fell many hundreds of years ago, and has moved from mountaintop to sea at as little as 20 metres a year. We had passed their brethren on the way here, all blue and bobbing in the sun, but growing imperceptibly smaller as they made their relatively hasty way to the sea and oblivion. In fact glaciers are no drop-in-the-ocean. They hold over 2% of earth’s total water, oceans included. And around 75% of the planet’s fresh water is held in glaciers. Were all of these beasts to become extinct, sea level rise would be catastrophic. Each ancient berg also carries small loads of silt and dust, some stolen from surrounding rock, some sprinkled on them from the heights, some added by short-lived streams that flow onto the glaciers in summer. All will be added to some far future sedimentary formation, when even the unthinkable depths of Tracy Arm will be forgotten, and a new landscape will joust with ice, rain, heat, fracture or whatever else is thrown at it. But the present action isn’t only mineral. Animal and vegetable stake a claim here too. On the congested ice dump beneath the glacier’s snout hundreds of harbor seals (Phoca vitulina) dot the ice. With the temporarily solid ice preventing orcas from attacking, the seals loll insouciantly in the sunshine. It must feel quite the opposite of skating on thin ice – at least until hunger forces their next fishing trip. From the surrounding slopes alder, hemlock and spruce watch and wait as the glacier retreats. In a mere dozen years it has retired hundreds of metres. Eventually, even in this dramatically steep terrain, there will be land ready for colonising. Others may be the first, but the conifers will surely follow. At the Mendenhall Glacier on the outskirts of Juneau, the glacier’s retreat has been systematically observed for well over a century. The Visitor Centre, high above Lake Mendenhall and several hundred metres from today’s glacier, was built where the glacier had been active as recently as 1935. Where once ice went unchallenged, there is now established coniferous forest. An ordered and predictable succession of growth has been noted, with lichen doing its rock-breaking, soil-producing work first. This is followed by pioneer species such as willow, fireweed and alder. Finally within 70-80 years the conifers start to predominate. A day in the company of glaciers has me comparing history with geology. We may read blithely of a coup that replaced King A or President B, with years of peace (or otherwise) following. So too we may study geology and read mechanically of the epic landscape-altering work of glaciers. But seeing the violence and mayhem of a glacier up close seems to me like witnessing a coup. History judges a coup by its outcome. So too will geomorphology judge a glacier by its resulting landforms. But what a privilege, albeit a dangerous one, to be there for at least a small episode of this earth coup, and to see first-hand the processes that once shaped so much of my island home, Tasmania.